A United Launch Alliance Delta 2 rocket stands poised to launch NASA's Grail moon gravity probes from the Cape Canaveral Air Force Station in Florida on Sept. 8, 2011. The $496 million Grail mission will map the moon's gravity in unprecedented detail. This story has been updated at 10:09 a.m. EDT. Bad weather has forced NASA to delay today's launch of two new lunar probes that are designed to make detailed studies of the inside of the moon and its gravitational field. Windy conditions thwarted two available launch opportunities this morning (Sept. 8), so the agency will have to wait until tomorrow to try again. 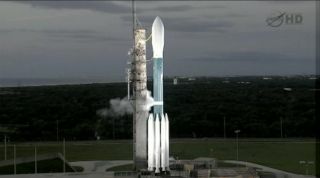 NASA's twin Grail spacecraft were scheduled to blast off on an unmanned Delta 2 rocket at 8:37 a.m. EDT (1237 GMT) this morning from the Cape Canaveral Air Force Station in Florida, but upper level winds in the area caused the agency to stand down. A second launch opportunity is also available tomorrow at 9:12 a.m. EDT (1312 GMT), but forecasts indicate weather conditions are not expected to greatly improve until the weekend. In addition to the threat of rain and thunderstorms, wind levels are monitored because they affect how rockets fly through Earth's upper atmosphere on their way into orbit. As a result, NASA sets limits on acceptable weather conditions to minimize any potential danger. NASA has a 42-day window to launch the Grail spacecraft that extends through Oct. 19, agency officials have said. Observations from the twin Grail probes are also expected to shed light on how other large, rocky bodies in the inner solar system formed.